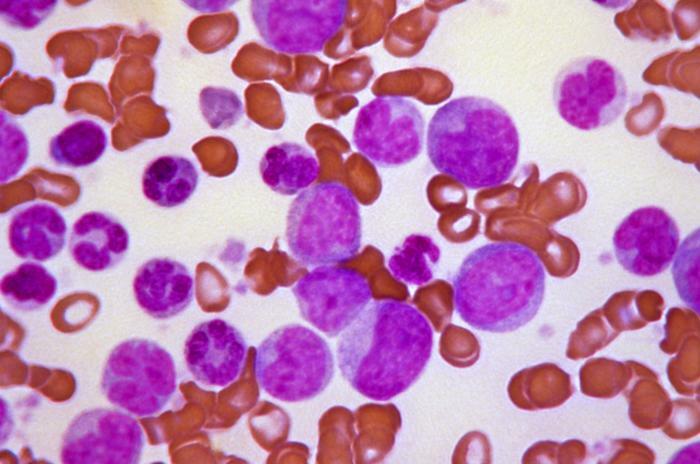 Leukemia is a cancer of the blood or bone marrow that affects over 200,000 Americans and still kills thousands every year despite the great progress made over recent decades in developing effective treatments for many leukemia types. When undergoing treatment for leukemia many patients require hematopoietic stem cell (HSC) transplantation to replace the blood stem cells that are killed off along with the cancer cells by radiation or chemotherapy. The most usual source of such HSCs is the blood or bone marrow of the patient themselves or a donor, but unfortunately it is often not possible to use the patient’s own cells because of the risk that some might be cancerous, while finding a donor whose cells are compatible with the patient is difficult, especially for members of ethnic minorities. As a result of the growing numbers of patients waiting for suitable cells to become available for transplant scientists have turned to another source; umbilical cord blood (CB) cells. CB cells have the useful property of being partially immunologically privileged so that the match between the donor and recipient does not have to be as exact as for bone marrow or blood derived cells, but this advantage comes at the price that only small amounts of CB cells can be obtained from each umbilical cord. To overcome this limitation on the use of CB cells scientists have sought to develop methods to expand in vitro the number of cells obtained from the umbilical cord before transplanting them into patients, and scientists recently announced the first successful clinical trial of in vitro expanded CB cells in leukemia patients (1) after a decade of research and refinement in mice. Blood smear of the final blast crisis phase of chronic myelogenous leukemia, a disease whose treatment often includes hematopoietic stem cell transplant. Reproduced courtesy of the CDC Public Health Image Library. Our story doesn’t however start with mice but with the fly Drosophila melanogaster, a key model organism in developmental research. Almost a century ago the geneticist Thomas Hunt Morgan identified a strain of D. Melanogaster which had characteristic notches in their wings, so the gene whose inactivation caused this trait was named Notch. Since the revolution in molecular biology got underway in the 1980’s scientists studying D. melanogaster have learned that Notch is a cell surface receptor which regulates the development of many tissues, and found that it plays a similar role in many other species, including mammals which have 4 versions of the Notch gene. This all became relevant to the expansion of CB cells when a team lead by Dr. Irwin D. Bernstein of the Fred Hutchinson Cancer Research Center found that the Notch 1 gene was expressed in human hematopoietic stem cells and decided to investigate the role of Notch 1 in regulating the ability of these cells to expand their numbers and subsequently differentiate into all the many different kinds of blood cell. A decade ago they used a modified virus to express Notch 1 in mouse bone marrow hematopoietic stem cells and found that these cells became immortal, producing far more cells than hematopoietic stem cells normally do in vitro, and that these cells could be made to differentiate into a wide range of blood cell types in vitro. However they found that while the Notch 1 expressing cells were incorporated into the bone marrow and gave rise to a wide variety of cell types when transplanted along with unmodified hematopoietic stem cells into mice whose own bone marrow stem cells had been removed by radiation treatment , they did not do so when transplanted on their own (2). This indicated that while using a viral vector to express Notch1 continually enhanced the ability of hematopoietic stem cells to self-renew and multiply it also impaired the other vital characteristic of these cells, namely their ability to differentiate into mature blood cells. To overcome this problem Dr. Bernstein’s team turned to a modified version of Delta-1, the natural ligand of Notch, which could be used activate the Notch pathway and expand hematopoietic stem cells in vitro. When the cells were transplanted into the bone marrow the notch pathway would no longer be activated to such an extent and the cells could differentiate normally. In the years that followed they tested and refined their Notch-mediated in vitro expansion technique, first using mouse bone marrow hematopoietic stem cells and when that was successful switching to human cord blood hematopoietic cells. All this time they evaluated the ability of modified cells to engraft and repopulate blood and thymus with the full spectrum of blood cells by transplanting them into mice; including NOD-SCID mice which were genetically modified to be immunodeficient so that they could receive human cord blood cells that can then develop into a functioning immune system. In the latest paper published online in Nature Medicine (1) Colleen Delaney and colleagues describe the final refinements to their technique. One major refinement concerned the source of the cell population to be expanded. In previous studies they used a sub-population of CB cells termed CD34+CD38- as the starting population in their in vitro expansion, a reasonable decision since CD34+CD38- are the most primitive form of hematopoietic cell with the greatest capacity to develop into the full range of other blood cell types. Unfortunately the purification of CD34+ CD38- cells is a process that itself entails the loss of many CB hematopoietic cells, not an ideal situation when they are already in short supply. So they compared a starting population of CD34+ cells with the more highly purified CD34+ CD38- population, and found that the CD34+ derived cells actually performed better when transplanted into mice. The Notch-mediated in vitro expansion technique they had developed and refined over the preceding decade had produced cells that were able to engraft into the bone marrow a lot more quickly than untreated CB hematopoietic stem cells and start producing immune cells earlier and in greater numbers, it was now time to take it into human trials. The phase I trials reported in the Nature Medicine paper involved transplanting the in vitro expanded CB cells alongside unmanipulated CB cells into high-risk leukemia patients, with the primary objective of evaluating the safety of the procedure. At the end of the trial it was apparent that not only was the procedure not associated with any unexpected safety concerns, but that engraftment of the transplanted cells and production of immune cells was significantly enhanced, enabling the immune systems of the patients to recover more quickly. While there are more and larger trials to come, this outcome raises the hope that umbilical cord blood cells will in future be able to offer many more leukemia patients the chance of earlier treatment and a quicker recovery. Posted on February 15, 2010 February 15, 2010 by EditorPosted in News, Science NewsTagged bone marrow, CD34+ CD38- cells, CD34+ cells, colleen Delaney, cord blood stem cell, Delta-1, Drosophila melanogaster, fly, hematopoietic stem cell, immune system, immunodeficient, in vitro expansion, Irwin D. Bernstein, leukemia, mouse, Notch, Notch 1 gene, paul browne, stem cell, Thomas Hunt Morgan, transplant, umbilical cord, viral vector, virus. This certainly portends an exciting future for the field of medicine once more research is done. Of course adult stem cells are being used to treat people, they have been for decades. The whole point of this essay was to show how adult stem cell therapies can be improved so that they can be used to treat more people more successfully. Having said that I would be very careful about the website http://www.cellmedicine.com. There are quite a few clinics out there, mostly located in countries where medical regulation is a lot less strict than in the USA (such as Panama), which offer stem cell therapies that go far beyond what is supported by scientific and clinical evidence. That website may refer to a lot of real research and clinical results but it is offering stem-cell therapy for diseases such as diabetes and cerebral palsy for which the evidence base for benefit in patients is extremely limited, almost non-existant. Even the evidence from animal studies is very limited. These therapies are still highly experimental and their benefits and potential harms very uncertain, and I therefor consider it highly immoral for these clinics to be offering these treatments to parients, especially when they will charge them thousands of dollars for them. These new therapies need to be evaluated in clinical trials to determine whether or not they benefit patients, only then should they go into wider clinical use. Adult stem cells from humans are already being used to treat real people with much success. Why are some posts discarded?